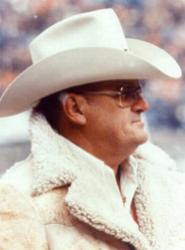 An Opinion On Sports: Bum Phillips: Yea, He Said It! (About how he was spending his retirement) "I ain't doing a damn thing, and I don't start until noon." (When asked if he played college football) "I thought I did until I looked at some old game films." "Two kinds of ballplayers aren't worth a darn: One that never does what he's told, and one who does nothin' except what he's told." "You don't know a ladder has splinters until you slide down it." When asked by Bob Costas why he takes his wife on all the road trips, responded "Because she is too damn ugly to kiss good-bye." "When I coached, players carried a six-pack. Now they have a briefcase on one hand and a lawyer on the other."